As part of my ongoing Celtic Symbols article, the Green Man has been one I have been looking forward to writing about for quite some time. Researching this article, you do come across some pretty strange videos and information. The Green Man is mainly associated with the symbol of rebirth, representing the cycle of growth each spring. Some say he is the ancient guardian of the forest. Some speculate that the mythology of the Green Man developed independently in the traditions of separate ancient cultures and evolved into the wide variety of examples found throughout history. The Celtic tradition was highly revolved around the fertility of the land, and lush vegetation was a sign of prosperity. Instead of repurposing the Green Man, the church embraced the Green Man through architecture. In fact, most European churches have Green Men hiding all around the walls and ceilings. Next time you are in one be sure to look around. You will be amazed as to just how many are scattered around from Ireland to even many parts of Russia! The reason the Catholic church didn’t seem to mind this Celtic symbol was because of Jesus Christ. As the symbol is of death and resurrection(rebirth), the church saw it as a way to spread the word of Christianity through symbology. Just who is the Green Man? Okay, it is great to know some meaning behind the symbol and where you can find it but where did this Green Man originate from? The earliest example of a green man disgorging vegetation from his mouth is from St. Abre, in St. Hilaire-le-grand, c. 400 AD. On a side note, when I was researching for this article, I was quite amused by the fact that an episode of the series “It’s Always Sunny In Philadelphia” comes up over and over again. One of the characters Chalie appears in the green man outfit time and time again over the series. Very entertaining show if you haven’t seen it. There is also a Green Man festival which is a mixture of folklore, dance and music. Just take a look at this giant Green Man from last years festival. Just a small green man. It is no surprise to see the Green Man has made his way into many pieces of jewellery and wall plaques. It has also recently become a symbol of eco-lovers and anything trying to show it’s a connection to nature. I guess this is mainly because of the relationship to nature and people wanting to emphasise this. If you do wish to do more research on this ancient Celtic Symbol, there is plenty of books available such as this book. It seems that the Green man is open to all sorts of interpretation. It feels very much like the man part of the Green Man is subservient to green; in other words, nature is a much more powerful force than we perhaps realise in our day to day lives. Other associations to this symbol include Robin Hood and the axe-wielding giant in Sir Gawain and the Green Knight. Let’s not forget the many pubs are called the Green Man. 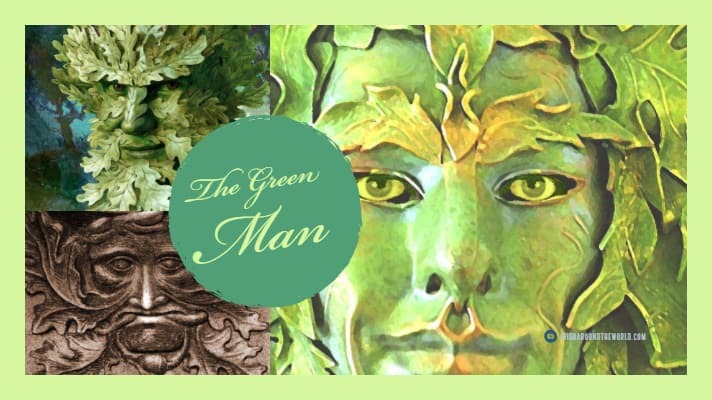 He is undoubtedly a mystical symbol; what else do you know about the Green Man? Comment below. Thanks for reading and be sure to share. P.S Subscribe and get your weekly dose of Irish straight to your inbox here.